TUNE IN AT 4 P.M. FOR CONTINUING COVERAGE: The 90.7 News team will have more coverage on this breaking story during All Things Considered starting at 4 p.m., including a conversation with WMFE Reporter Brendan Byrne and Emily Lang at 4:44 p.m. Tune in to 90.7-FM or stream at wmfe.org or through our mobile app, or ask your smart speaker to play WMFE. The state attorney’s office has ended a six-month investigation into the Pulse nightclub shooting, concluding no civilians were shot by law enforcement. The question of friendly fire has plagued law enforcement since the June 2016 shooting left 49 dead during Latin Night at the predominantly gay nightclub. The state attorney used the Federal Bureau of Investigation’s ballistic report, as well as witness accounts, video evidence and 911 calls. Law enforcement opened fire five separate times during the standoff, which lasted more than three hours. In total, 14 officers fired more than 180 shots – but hit no civilians. 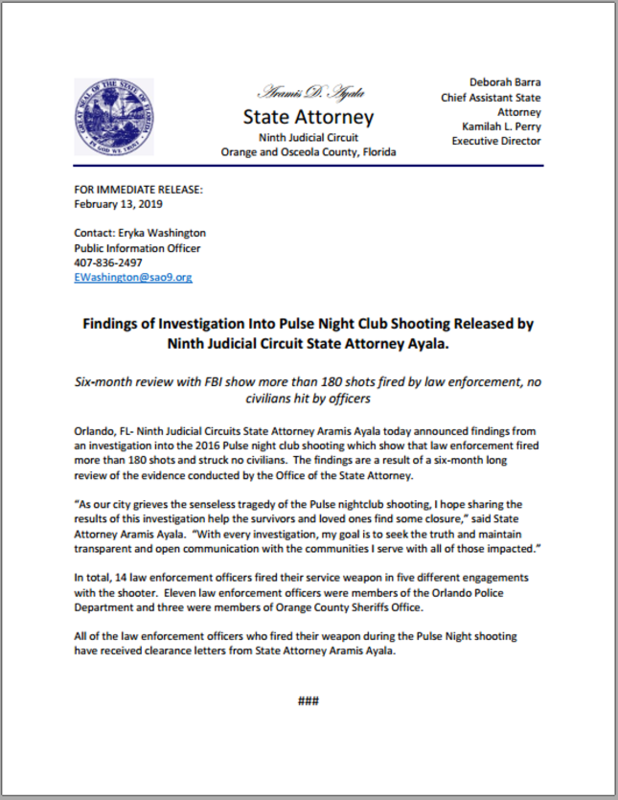 “As our city grieves the senseless tragedy of the Pulse nightclub shooting, I hope sharing the results of this investigation help the survivors and loved ones find some closure,” said State Attorney Aramis Ayala in a news release, available here. All 14 officers have received clearance letters from the state attorney that the shooting was reasonable and justified. Eleven of the officers were with the Orlando Police Department, and three were members of the Orange County Sheriff’s Office. Orange County Sheriff John Mina – formerly the Orlando Police Department’s chief – said an event like today could bring back emotional trauma for first responders. “And reviews of these incidents sometimes bring back those feelings, so we’ve offered again all of our services available in the form of our mostly employee assistance program and organizations like UCF Restores,” Mina said. UCF Restores is a government-funded clinic for veterans and first responders with post-traumatic stress disorder. An investigation last year by WMFE and ProPublica found multiple first responders to the Pulse nightclub shooting struggling with PTSD years after the event. That includes several who were fired or forced to stop working because of PTSD. State Attorney Aramis Ayala has issued clearance letters for 14 police officers who opened fire during the Pulse nightclub shooting. No civilians were hit by law enforcement.